1. Church discipline should not ban a person from church- only the sacraments. The exception would be if someone physically threatens leadership or other members (estranged spouse, for instance). To treat someone as an tax collector is to treat them as one in need of the gospel the church is supposed to offer. It is not to “shun” them. 2. Church discipline is not appropriate for merely questioning church leadership. Insecure people can’t tolerate disagreement and may abuse church discipline to get rid of people. This is not the same as rejecting a core doctrine of the church. How the person expresses their disagreement or questions may be a matter of church discipline, but that isn’t the same thing as saying something you don’t want to hear. 3. Church members should not be disciplined for asking to see church financial records. That these people sued to see them is a result of church leaders who were unreasonable or wanting to hide something. Godly leaders are above board and don’t have to hide financial records. There is a bigger problem at work when churches refuse to let MEMBERS see financial records. 4. Pastors should generally not discipline a person who confesses unless that sin is heinious, or the offender an officer. Confessing a sin is an indication that the person in question is repenting and attempting to deal with the sin. In some matters you may want to suspend someone from office or from the sacraments, but since they are repentant you are not removing them from the church. You are showing them the severity of their offense with a consequence which is temporary. Oh, the wonder of the internet. Now you can check flight status on line. The flight from Guangzhou left a few minutes late, but arrived in Tokyo a few minutes early. They most likely made their connection to Detriot, which left right on time with the new ETA of 11:43 am. According the flight tracker, the strong tail winds keep pushing the ETA up, now 11:39. They are over British Columbia at the moment and all is going well. She hopes to get on an earlier flight, standby, rather than “enjoy” the 7+ hour standby. Eli would be able to get some ants out of his pants, but that’s overboard. However, with NW’s odd scheduling, there may be nothing else. I’ll update as I learn more. I imagine I’ll get a phone call from Detroit, or 2 or more. Update: NWA amazed me, they have a flight departing at 1:45. They are on standby (3rd in line), so they might make it in time for me to drive through Tampa’s rush hour traffic. If I don’t hear from her by 2 pm, I’ve got to hit the road shortly thereafter. She said that he did “great” on the trip thus far. A huge answer to prayer. Update #2– She made it on the flight. The bags may be a different matter. Update #3 Somehow the bags showed up. We were able to get home in time for dinner. This is the exact opposite of her trip to China. He did okay his first time in the car seat- but that could have been the exhaustion. CavDaughter was SO excited, she was jumping up and down in the driveway. CavSon was very overwhelmed, and was particularly uncomfortable when Huck was around. He went to bed around 7 pm after a quick bath, and is still sleeping at 9 am. That’s one tired little boy. The Globe is reporting that Johan Santana is being traded to the Mets, pending a contract extension. They gave up 4 prospects to get him. We keep Jacoby who is one exciting player to watch and can change a game in numerous ways. We keep Lester who may be fully recovered from his chemo and showed great poise in Game 4 of the World Series after having not started in some time. We keep Lowrie, who may never play for us, but may get us someone who will. We don’t have to deal with the problem of having a $20 million ace when we have other pitchers wanting new contracts who by then may be better than Santana. Best yet, he’s going to the National League, not the Yankees (they are thinking the same thing). The Twins lost out by waiting too long. As they waited for the Sox and Yankees’ offers to get better, they ended up losing both teams. The Yankees never really countered the Mets offer, and Buster Olney says the Sox’ counter-offer was not as strong as the one they made in December. I’m not sure who they took off the table, though I’d guess Ellsbury. Either way, the Twins settled for a subpar offer from the Mets. They got a great pitcher w/out giving them the farm. So, what do we do with Coco? Today was the FL primary. I nearly forgot due to brain fog. I am feeling somewhat better though. Some friends and I were talking about this Sunday. It was difficult to decide for whom to cast my vote. It was far easier to decide who I definitely wasn’t voting for than who I was. Pragmatism entered the picture as well. All things being equal, I would have voted Huckabee. Some TRs think you shouldn’t vote for him because of theological differences. Ah, he’s running for President of the U.S. not a denominational seminary or pastor of a congregation. I care about his political views, and he seems to affirm the things I affirm. I think he’s the most likeable and the best communicator of the bunch. But he is going the way of Guliani, Thompson, Paul and Hunter. He’s irrelevant. I once voted strictly by conscience and Bill Clinton won because I, and many other conservatives, just couldn’t get behind Dole. I learned that politics can often be the lesser of 2 evils. So, McCain and Romney are the guys with a legitimate shot for the nomination. I have to vote for one of them, and there is no way I’m voting for McCain in the primary, which left… Romney. I nearly want to cry. I voted for a guy who can’t seem to win my confidence aside from the fact that he’s not John McCain. Pathetic. And I may still have to vote McCain again in November because the Democratic frontrunners have no idea how much their proposals will foul up the economy for generations to come, and I don’t even want to image the international nightmares they pose. I thought I’d already written this post, but it got lost in my cold/adoption haze. While on vacation I re-read Prince Caspian by C.S. Lewis. It is the second book in his Chronicles of Narnia series. The four kids are mysteriously recalled to Narnia. 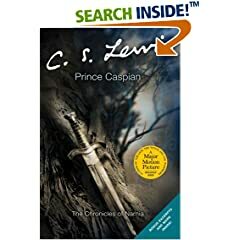 They discover that hundreds of years have passed and they are needed to help a young prince, Caspian, claim his throne from a usurper who has sought to destroy all that is good in Narnia. There is not as much action in this story as in The Lion, the Witch & the Wardrobe. It will be interesting to see how they adapt it for the big screen. I don’t want to give away too much. In the middle of the book Lucy asks another question, this time of Aslan himself. An apt way to put maturing in Christ. The more we know know Him, the bigger He becomes in our view. Just like John the Baptist, we must decrease so He may increase. CavWife was worn out. It had been a day filled with whining. He hadn’t slept well either. Here’s hoping the travel day is better or it will be one looooonnggg day. They went to the consulate, swore the records were true and got the visa & passport. She is more than ready to be home, sleep in her own bed, and see CavDaughter (I might figure into that somewhere too). Preparations have begun for her arrival. The back porch is being cleaned. Dusting, vacuuming, grooming the dog, final prep for the crib …. If all goes well, Wednesday night after CavDaughter goes to bed I’ll head off to the airport to meet my wife and new son. Update: If all went according to schedule- they should have just taken off from Guangzhou. It is hard for me to conceive of all this- the reality of it all probably won’t sink in until I hold this little boy. CavWife has a headstart on me. It is actually scary …. what changes will this require of each of us. I know God’s grace will be sufficient, but that doesn’t mean it will be easy or painless. I’m feeling better … not as much coughing today, no noticable fever. I did have sinus and teeth pain. I also did some weeding, and the knee did well too. This has been a big drag on my spirits, so hopefully I’ll be more like me when Eli arrives.